The idea to use pancake mix for batter comes from Rachel Ray's video. She didn't give out exact measurements, so I had to guess what I needed to make apple fritter rings from 3 large apples. Also, instead of water as the pancake box recommends, club soda is used including 1 large egg. Another addition is cinnamon sugar coating instead of powdered sugar sprinkles. Turned out great! Heat oil, 1-2 inch deep in a frying pan. Mix sugar and cinnamon in a shalow bowl then set aside. In a large bowl, make the batter by combining pancake mix, club soda and eggs. Core and slice apples into rings. Dip apple rings in batter and fry until golden brown. Remove each ring and place on top of multiple-layered paper towels to drain oil. 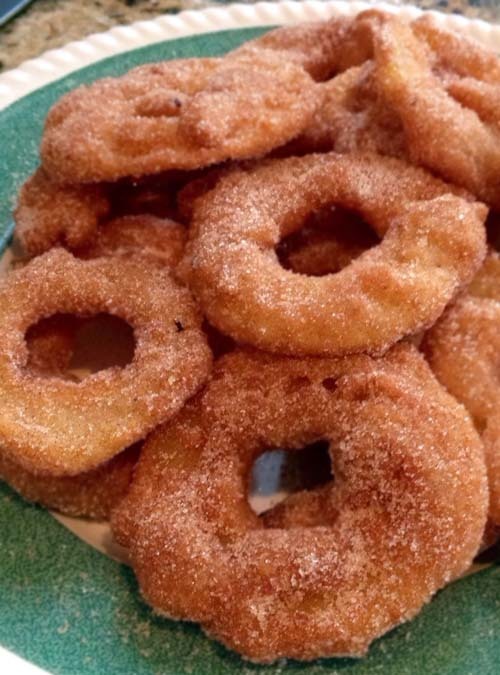 For topping, either sprinkle cinnamon sugar on top of the fritter rings or dip one side onto the cinnamon sugar bowl. Repeat the steps for each fritter, let cool and serve.